who have PAID to have their name listed here! Please send them your BEST Offers! "All the advertisers listed on this page truly have something to offer YOU!" deceased, out of business, or nixie during our mailings. WITH YOUR NAME ON THIS LIST . . . Your 40 Words Or Less Listed Here For 1 Year! "You've got what in your computer?" NO MATTER HOW you feel about computer games and gimmicks (I couldn't care less about them), if you haven't seen the screen saver called "Marine Aquarium," you're missing a real treat. It's not stupid cartoons . . . but the most realistic, exotic fish you've ever seen, swimming in (seemingly) endless, random variations, as if you had gone in through the top of your computer, Tim Allen - style (arr, arrr, more power! ), scooped out the insides, filled the thing with water, rocks, shells and sea plants even a little pump sending up a column of bubbles (yes, you can hear them if you have speakers attached to your computer) and rare tropical fish. Touch the space bar, and you'll have a window that not only lets you choose which species you want in your "aquarium," but also tells you their names in both English and :Latin (I'm not kidding) - where they're from, what they eat . . . It's simply mind-blowing! 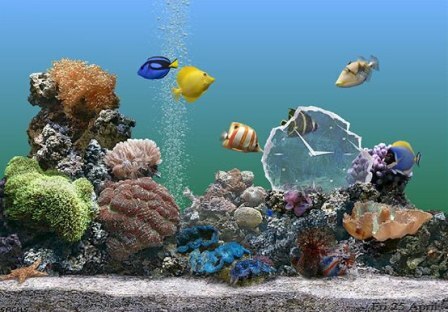 Marine Aquarium is not only a great way to enjoy a fish tank without any of the usual headaches (cleaning, feeding, etc. ), the next time someone sticks his head over your shoulder and says, "Duh, whatcha doin' with your computer?" you can just click on the icon and say, "Oh, nothing'. . . just watchin' the fish."